Below are some great photos and photo gallery of our February 29, 2012 “Turn It On” Ceremony inaugurating our Wind Turbine. Summary: Over 80 people gathered on the hill outside the church and school on Leap Day 2012 for a joyous dedication of the wind tower. We had numerous community guests and dignitaries, but the star of the event was definitely the tower and turbine. As celebrants arrived, the tower was at a 45 degree angle, dramatically demonstating the hinged tower and motorized raising screw that makes our investment hurricane proof and easy to service. As the ceremony got underway, installer Jeff Cabrera could be seen behind the speakers installing the bolts to fix the tower in place. After numerous brief speeches, the tower was christened with water balloons (champagne being too messy), and then several dignitaries, including Lt. Governor Greg Francis, threw the switch to begin feeding power from the tower into the island’s grid. Afterwards, refreshments were provided by the Kingshill School Board. Others recognized at the ceremony included Wind Project volunteers: Don Bailey (treasurer), Will Borden, Stan Joines, Don Buchanan, and Janie Koopmans. 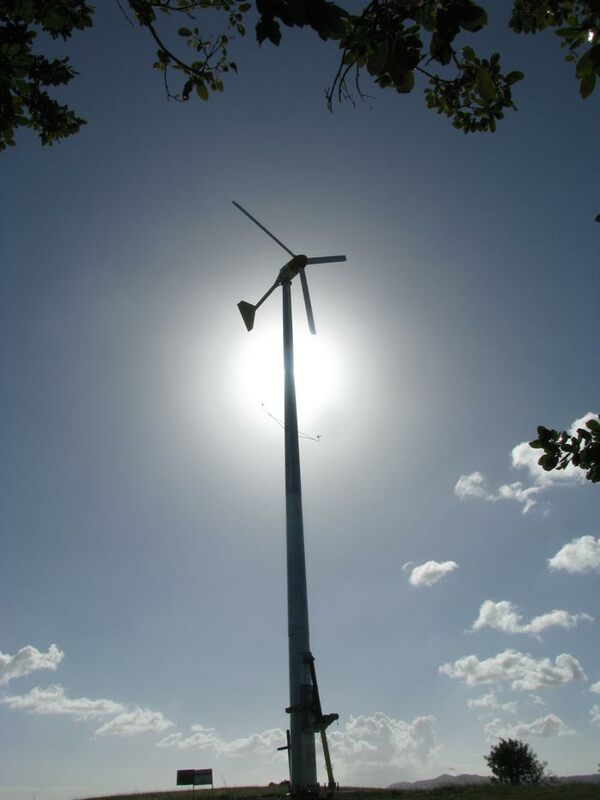 2018 Update: Our turbine was damaged by Hurricane Maria (even though it had been lowered). A decision was made to give it to another non-profit on island who could afford to repair it, and use an RCA grant to install solar panels instead (which is now feasible due to lower panel prices and our lower electrical consumption because the school we once housed closed during the recession). Posted on March 2, 2012, in Worship. Bookmark the permalink. Comments Off on Wind Turbine Ceremony Photos.